Citation Information: J Clin Invest. 2012;122(8):2967-2982. https://doi.org/10.1172/JCI62860. Viruses are leading causes of severe acute lower respiratory infections (LRIs). These infections evoke incomplete immunity, as individuals can be repeatedly reinfected throughout life. We report that acute viral LRI causes rapid pulmonary CD8+ cytotoxic T lymphocyte (TCD8) functional impairment via programmed death–1/programmed death ligand–1 (PD-1/PD-L1) signaling, a pathway previously associated with prolonged antigenic stimulation during chronic infections and cancer. PD-1–mediated TCD8 impairment occurred acutely in mice following infection with human metapneumovirus or influenza virus. Viral antigen was sufficient for PD-1 upregulation, but induction of PD-L1 was required for impairment. During secondary viral infection or epitope-only challenge, memory TCD8 rapidly reexpressed PD-1 and exhibited severe functional impairment. Inhibition of PD-1 signaling using monoclonal antibody blockade prevented TCD8 impairment, reduced viral titers during primary infection, and enhanced protection of immunized mice against challenge infection. Additionally, PD-1 and PD-L1 were upregulated in the lungs of patients with 2009 H1N1 influenza virus, respiratory syncytial virus, or parainfluenza virus infection. These results indicate that PD-1 mediates TCD8 functional impairment during acute viral infection and may contribute to recurrent viral LRIs. Therefore, the PD-1/PD-L1 pathway may represent a therapeutic target in the treatment of respiratory viruses. Kinetics of HMPV viral replication and lower airway pathology. (A) B6 mice were infected i.n. with HMPV and viral titers were quantified for the lungs and nasal turbinates in PFU per gram tissue (n = 3–6 mice per time point). Dotted line indicates the limit of viral detection. (B) Real-time RT-PCR targeting the HMPV N gene was used to quantify genome levels in the lungs of infected mice at the indicated times after infection (n = 5–10 mice per time point). Arrow indicates the time at which mice were challenged with HMPV. 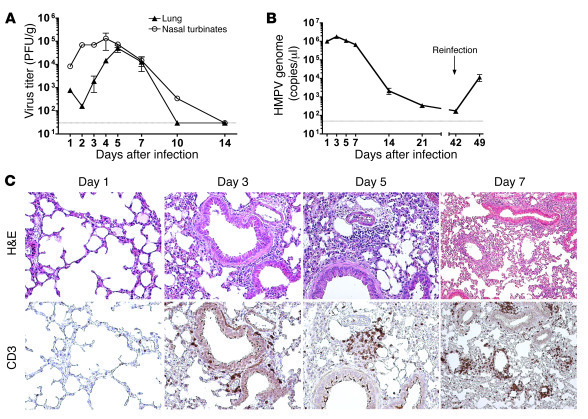 (C) Images represent serially cut lung sections stained with H&E or anti-CD3 and are representative of 3–5 individual mice per time point for which viral titers were determined to confirm infection. Original magnification, ×200 (days 1–5); ×100 (day 7). Data in B are representative of 3 experiments.